You might be surprised to find that, as winter sets in here in Iowa, we’re eagerly planning our garden for 2009. In fact, I’d argue that the winter season – spent planning, preparing, and organizing – is as important as the other seasons for having a manageable and cost-effective garden. What’s so important about gardening? 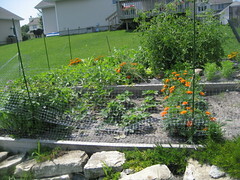 A well-planned and well-cultivated garden not only provides healthy food all throughout the summer and fall, it also provides a very inexpensive hobby that gives you exercise, a lot of fresh air, and an opportunity to get your hands in the dirt. An afternoon in the garden is not only fun, it makes me feel healthier, provides healthy food for my family, and scarcely costs a dime. What am I doing right now to plan ahead for next year’s garden? Here are ten winter tactics that I use to prepare for the spring. I spend some time thinking about what exactly I want to plant – what vegetables and fruits do I hope to get from my garden? For me, this is usually led by the dishes I want to make – for example, if I want to make a lot of salsa, I’ll plan for lots of tomatoes and make space for peppers and onions. This usually involves getting a number of seed catalogs as well as searching online for more information. For example, if I’m making salsa, I like very firm tomatoes that don’t have many seeds. Knowing this, I dig through online forums and seed catalogs seeking the kind of tomatoes I’m looking for. This year, I intend to plant some Rio Grande tomatoes, of which I’ve read several recommendations. The earlier I get the seeds, the more sure I am that I’ll get the varieties I want as early as possible. I want to get them early – in January or February – so I can get the plants started in the house before spring begins. Once I have the seeds ordered, I take the information about growing times and my own knowledge about temperatures in Iowa and plan when I should start the seeds inside – usually sometime in late February. Some people start seedlings earlier than this, but I’ve had bad experiences with late frosts lately and I’d rather be safe than sorry. This is actually quite easy. All you need is some soil, some reusable plastic cups, and your seeds. Poke a few tiny holes in the bottom of the cup, add the soil, then plant the seeds. Obviously, I do this in concert with the growing calendar. I also hang up a grow light over the plants that turns on and off every twelve hours, simulating daylight. Then, each day, I just go water the cups. Easy as pie. While it’s too cold for the compost to really work in the winter, we still toss vegetable waste, egg shells, and coffee grounds into the composter. In the early spring, when the weather begins to warm, we’ll just add water and a few handfuls of soil (and maybe some compost starter) and a few weeks later, we’ll have wonderful compost. On decent winter days where I must go outside out of stir-craziness, I’ll go out and get my garden equipment in shape. I clean it up, make sure it’s dry, and sharpen things that need sharpening (like pruning shears). This way, when the weather actually gets nice, I’m ready to head right out to the garden. Since winter months are time to hole up inside and read, I do just that. I grab some gardening books from the library and learn more about gardening techniques in Iowa. If I see any good ones, I jot them down and try to implement them in the spring and summer. I love using newspaper to cover the garden (leaving just gaps for the plants to come up). With a bit of straw on the top, it’s a great way to keep the weeds at bay. So, during the winter, I save up the newspapers so that in the spring I can easily make a layer of paper on the garden several sheets thick. On the coldest day of the winter so far, I unthawed some whole tomatoes. They were delicious – a slightly sweet taste of summer that not only fulfills me now, but motivates me to get out there and garden in the spring. Gardening is a spectacular frugal hobby – and winter’s just as good a time as any to get started!